Android games programmers now have the power to write games for Android tablets. Beginning Android Tablet Games Programming explains how to enhance your Android games using the new tablet interface and the additional screen estate. You’ll learn how to bring your programming skills up to date and into a world where touch screens, games physics, and artificial intelligence come together in new and surprising ways. 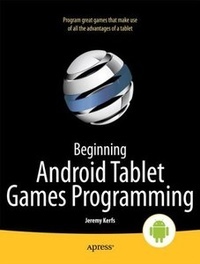 Beginning Android Tablet Games Programming shows how to quickly and easily set up an Android development environment—in no time at all, you’ll be programming away. You’ll begin with some simple games using sprites and choreographed movement. Next, you’ll learn how to handle user input in the modern age of touch screens and motion. Along the way, you’ll discover how to use that extra screen space on a tablet to provide more relaxed and more interesting user interactions in your games. You’ll learn how to use sound and music, for instance, to make your application menus more user-friendly. The Android operating system has recently acquired multicore functionality to meet the demands of multicore devices now entering the tablet market. With Beginning Android Tablet Games Programming, you’ll discover how to harness that new power with your games programming through more process-demanding and fun techniques, including physics modeling, rich game world representation, artificial intelligence, and multiplayer interactions. Throughout each chapter of Beginning Android Tablet Games Programming, you’ll find code that you can add or adapt to your own games to create the components you want. You can also work up to wrapping everything together into a complete Mario-type example game. Finally, when you have your first games ready, learn how developers have released their games and made a profit. You’ll find tips on how to present your games in the Android and other application markets, and a solid approach to games marketing and monetization. Игра баланс мяч Balance Ball.